In this suspenseful game of skill, play your pieces carefully or fall victim to a Snap Attack. Careful... Play just one more piece... So carefully, and... SNAP! All of the pieces on the board suddenly snap into a single stack, leaving you the victim of a Snap Attack. This nerve-testing game of skill takes traditional stacking games to a new dimension. 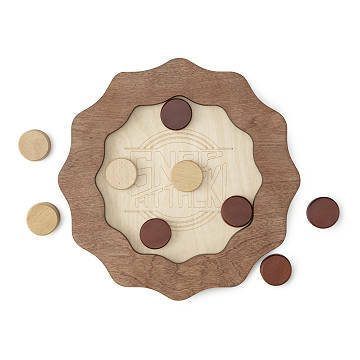 You and another player take turns placing magnetic pieces on the board, using a strategic eye and a steady hand to avoid being the one to trigger all of the pieces to "collapse" into a single stack. The board is crafted from handsome birch wood, and is attractive enough to leave out on display where it can attract players who want a burst of fun. Some magnets made in China; all other components made in Milford, Connecticut. Please note: strong magnetic field can affect functioning of hearing aids, pacemakers, and other electronic devices. Click here to see Snap Attack rules. Great concept in theory - boring to play once you get "it"
This game is a HOOT! We all (ages 6 to 69) had so much fun playing this. It's very suspenseful and everybody totally freaks out when the magnets snap together. Lots of laughter and screaming! I was impressed with my kids' creative problem solving in finding ways to place all their magnets without making them snap. The kids all played with the magnets for hours afterwards even without the board. Way cool! We love the simple design and innovative concept. Easy for children to play but challenging for adults as well. It seems to be sturdy and made a great gift. My son loves magnets so when I saw this game I thought he would enjoy it. Then when the box came, and I of course tried it out before giving it to him (quality control!) I was worried that it would get boring quickly. Boy was I wrong!! We have had so much fun playing it over and over. With an older brother and sister that don't always want to play games with him, this one has won everyone over and we battle for who gets to play first. Terrific game, beautifully made, and a great value. Engineers love this and so do the kids! This has become a fun game for my brother and is children. It is not too difficult for elementry children but challenging enough to keep adults engaged. Great for building thinking skills. This was a hit and a fun game. I believe this game will be played often. Great for all ages. Great fun! The magnets are extremely strong and fun to play with even not with the game. The name SNAP Attack describes the game perfectly. Great quality wood product. The game attracts attention from all. It's fun for all, everyone comes to the scene to check out the fun. It really satisfied my quest for a simple game for all ages.